I have not posted for a while and I am glad to say that I finally have something to show for it. 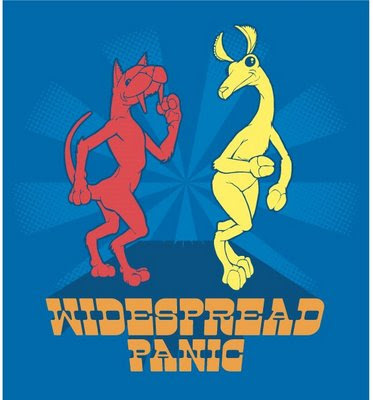 I was recently commissioned by a previous employer to create some t-shirt designs for the band Widespread Panic. I was told to be influenced by Grateful Dead art. I was also told that we were going to try and use a printing technique were the ink is thin and washed out; hence the slightly faded colors in the designs. The following illustrations and designs are the best ideas that I came up with. People who have previously been to my blog may recognize the last design. It was a design I did for Iron and Wine that was rejected. I thought it was strong, so I updated it and put Widespread's name in there. I would be delighted to know which one is your favorite. I'm prone to the blue skull and flowers illustration. I think it bespeaks 'Panic' better than the other images. Great work all around! Sorry about your femur bone, that hurts just thinking about it. Hope you're recovered. I'm torn between the skull and the elephant on the lion...I like the text use in that one (elephant) and it seems a bit riskier...Sharp stuff. Wow, cool gig... congrats! I like 'em all, I really dig the dancing creatures, but the layout on the elephant taxi is awesome. Guess I'll take one of each. Josh, this is Kim, Mollie's friend. Iron and Wine missed out - the lion and elephant design is outstanding.